We have had a series of Sunday snow events here with lots friends and family. My philosophy is if you are buried in snow then play in it! They have all seen my winter center piece and a quick and easy way to have something new is to change the center piece. Our home is designed on the great room concept so the kitchen flows into the dining room which flows into the living space. Changing the center piece affects all three spaces. I decided to experiment with an original DIY concept using wired ribbon. I combined it with some of my Crate and Barrel tea candle holders and paper doilies. It took about 20 minutes to create. That even included clean-up! Guests that came to snowshoe and enjoy lunch with us are planning to copy the idea. I'll include quick steps below. 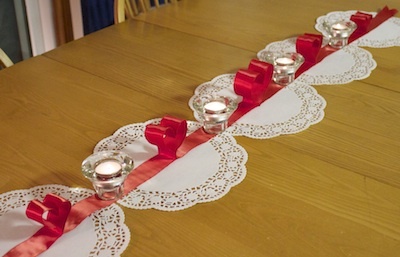 The wired ribbon is one long piece with hearts shaped equally spaced along its length. I created five hearts and then used four tea candle holders in between to weight them down, hold them in place and add the romantic candle light. I created the hearts in three sizes with the middle one being larger than the ends. 1 roll 4 yd x 1 1/2" Satin Wired Ribbon. Cut a piece of cardboard 9 x 3" long to use as a template to help space the hearts evenly. Use it to measure in 9" along the ribbon. Bend the ribbon over the cardboard edge to get a crisp bend and shape a heart. Place a glue line along the base where you see my fingers pinching the heart together gluing the two sides of ribbon in place. I used Glue lines but I expect a glue gun would work just as well. 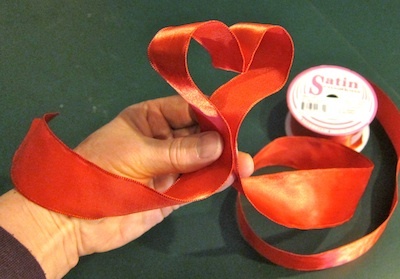 Use the cardboard template to measure out 9" from the base of this heart and fold the ribbon back over the template. Create heart #2 repeating the steps in heart #1. You can make the second heart a little larger and the middle heart another increment larger but be careful. They do have trouble standing up if you make them too large. Repeat these steps until you have five hearts. You could have three for a shorter table or seven for a longer table. Generally it is best to stick to odd numbers in design. Place a row of paper doilies along the table (or a white runner if you have one). 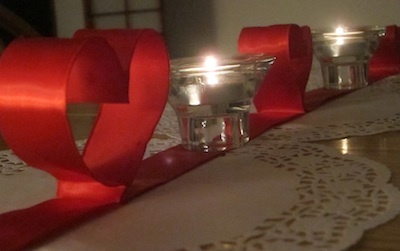 Position the ribbon row of hearts on top and place the tea lights to weight it down and hold in place. Once in place you will probably have to reshape the hearts. Now it is time to plan a romantic dinner to go along with the candle light. WOW!!!!!! Now I wish I had a table that this would work on! Nice DIY!! !